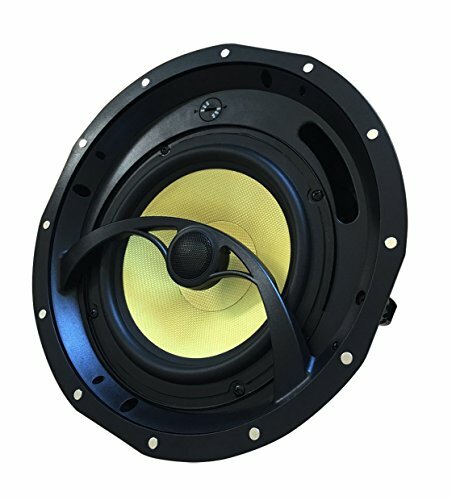 SOLD INDIVIDUALLY, NOT AS A PAIR.The Silver Ticket YK82C 8 inch 140-Watt 2-Way In-Ceiling Speaker is a versatile speaker meant for anything from simple stereo applications to whole-home audio and theater systems. Suitable for 5.1, 6.1, and 7.1 home systems. The woofer cone is woven fiber to ensure high-quality, long-lasting sound that will bring movie action and music vocals to life. The high-grade rubber edge allows for true audio accuracy and quality that will last. The 25mm titanium silk dome tweeter pivots for micro-tuning of the sound placement. Included above and beyond competitors is the extra heavy weight, high-strength magnet with its field of energy perfectly tuned with the voice coil - it's all about true efficiency. What does this all mean? - It means you get an excellent speaker that is loud, but not noisy. The speaker will not sound harsh when turned up; it maintains excellent clarity at all volume levels. The magnetic grille ultra thin bezel accent trim around the edge of the speaker provides a clean appearance The flip-lever quick-mount system makes installing the speaker easy and secure. Each box also includes a wall hole cut-out template and paint masks.SOLD INDIVIDUALLY, NOT AS A PAIR.